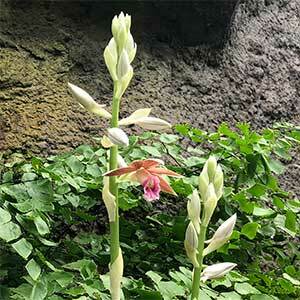 Moisture loving Phaius orchids have earned the common name of ‘Swamp Orchid’. The genus includes Australia’s largest terrestrial orchid and although htey are not widely offered for sale,these are a very attractive orchid for those who have the appropriate conditions. Generally large growing, species such as Phaius tankervilleae can reach to 2m in height, large broad green foliage and tall flower spikes above this is a popular species in sub tropical climates. Phaius are a group of about 50 terrestrial orchid species found from Africa through to the Philippines and Australia. Growing in a range of conditions from swampy areas through to forests and grasslands Phaius Orchids are a varied genus. These orchids that like lots of strong filtered light, not direct sun. They also like moisture but good drainage. Tall and with large flower spikes they are an excellent orchid for the hobby grower. All species require filtered light. Constant moisture, however good drainage. High humidity in summer, so stand pots over a tray of water. Phaius australis is one of the largest species of ground orchids in Australia. Phaius bernaysii is known as the ‘Yellow swamp orchid’ and is regarded as rare both in cultivation and in the wild.